Google Analytics information can include values such as timestamps, page titles, keywords and page referrers which can be located on a user's computer. These values can be located in Cookie files and Browser cache files. 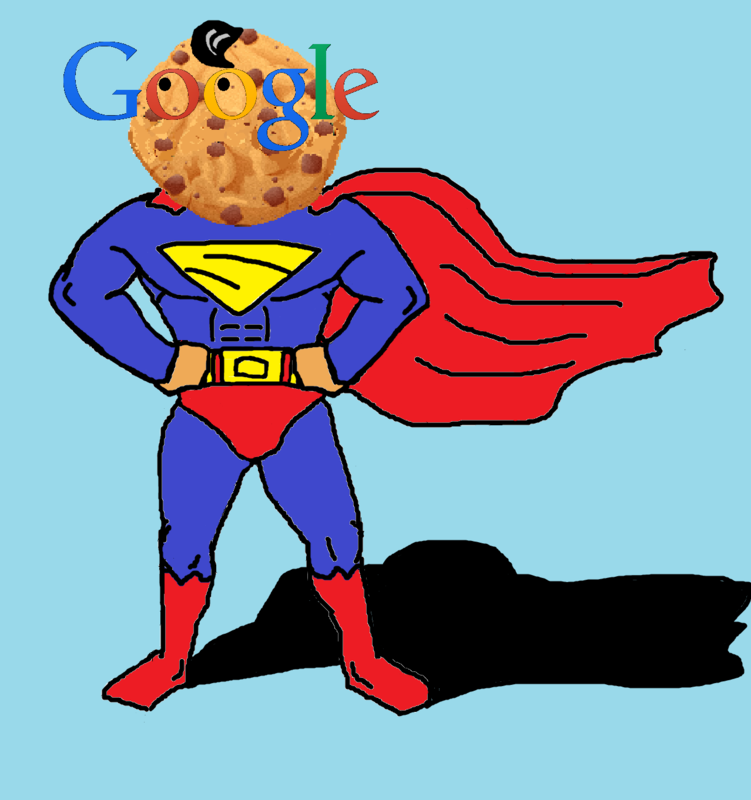 A while ago I wrote a blog post about the Google Analytic Cookies and the Cache files. Rather then focus on how to parse these artifacts like previous posts, this post will dive into how you can use deleted Google Analytic artifacts to build a much more comprehensive timeline as well as how to recover them using Scalpel. I had a case where the user account was deleted, and the client wanted Internet History recovered to show a pattern of activity - not just that the user had been to a site once, but many times over the course of the time they had access to the computer. Although I tried two commercial tools to recover deleted Internet History, it was very little and over a short period of time. This is where Google Analytic artifacts stepped in and saved the day. 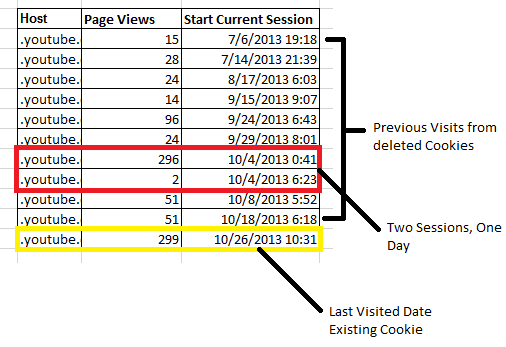 I was able to recover a large amount of cookies from unallocated space and cache files to build up a timeline that showed a pattern over time - much, much more then the Internet History I recovered with the commercial tools. Even if you are working with an existing user account, adding these artifacts can build out your timeline even more. I'll explain what I mean below. Take the cookie highlighted above in blue for an example. By looking at the displayed information we know the host name, last time the domain was visited and how many hits it had. But what do the hits mean exactly? Were all of these 136 hits done in one day? Were they spread out over the course of the year? What about all the days/visits prior, if any? Look at all the information that is now available compared to viewing just the one existing cookie! Instead of being presented with one visit date and one hit count, we now have previous visits, keywords, referral pages and how many pages were viewed in each session. This can further be built upon by adding the __utm?gif cache values which can have over 30 other variables such as page title and referral page. 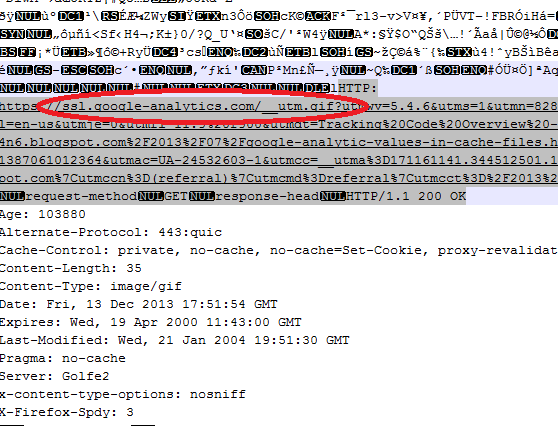 I have also seen values like usernames in the cached URLs which could extremely helpful. The real power of the Google Analytic artifacts comes into play when deleted artifacts are recovered. By using Scalpel and then parsing the carved files you can have some new data to play with and analyze. Based on some initial and limited testing with Internet Explorer 11 and Windows 7, it appears the browser deletes then creates a new cookie when visiting a website rather then overwriting the old cookie. This means there could be a lot of cookies waiting to be recovered. Scalpel is a great program for recovering, or 'carving' for deleted files. It's a command line tool which is included in the Sift Workstation, or it can be downloaded from here. If your unfamiliar with how to use Scalpel or need a refresher,Cheeky4n6Monkey has a great post on how to use Scalpel, including how to add custom carvers like these. The configuration file itself has detailed instructions on how to add custom file types, but here is a quick explanation of the entries I've made. The first column is the file extension. In this case it's arbitrary and you can use whatever you like here. For instance, I could have also used .txt instead of iec (which I chose to stand for Internet Explorer Cookie). The second column is whether or not the header is case sensitive. In my test data for IE, I have always seen them in lowercase so I used 'yes' to help reduce false positives. The third column is the max size for the file we are carving. Since each IE cookie should be relatively small, I have used 1000 bytes as the value. Safari Binary cookies have "cook" for a file header. Since one Safari Binary Cookie file holds all the cookies for the browser, the file size can be larger then the IE cookies. To be on the safe side I have specified a much larger file size of 1000000 bytes. The footers on Safari Binary Cookie files are not always the same, so I have left this value blank. When Scalpel carves all these file types, they will each be dropped into their own sub directory automatically. Opening up each carved file and manually parsing it for all the _utm values could be pain, especially if you have hundreds of recovered files. To that end, I have updated GA Cookie Cruncher to handle carved cookies for Internet Explorer and Safari Binary Cookie Parser for Safari Binary Cookies. What do I mean by "handle"? When recovering files, sometimes the files are fragmented, incomplete or there may be some false positives. For example, if you were to try and open an incomplete Word Document in Word, it might close and give you an error. Both of the above programs can handle these situations. If the file is incomplete, it tries to get as much information as it can, then moves on to the next file. What this means is that once you carve the files, you just need to point the programs at the directories and let them parse as many values as they can. There might be a few more steps involved then just pushing a button, but in my case is was worth it. The December 2013 issue of OUCH! is out, and I am pleased to be this month’s guest editor. The SANS Securing the Human team is impressive and it is always a pleasure to work with professionals with such diverse security backgrounds. If you aren’t familiar with OUCH!, it is a free Creative Commons resource intended to supplement user awareness training. OUCH! is translated into over 20 languages by a team of incredible volunteers. Pass it along to any loved ones getting a tablet computer this holiday season! Tom from the c-APT-ure blog recently pointed me to the Malware Analysis Quant Research Project spearheaded by Securosis. The goal of the project is to develop a malware analysis model, complete with specific processes and metrics. The published white paper is 53 pages. Every organization has a malware problem and rapid identification and scoping is a big step towards successfully allocating precious security resources towards important events like attacks from determined adversaries as opposed to commodity worms and malware. The open nature of the model allows existing infrastructure within your organization to be readily integrated, shifting the focus towards identification and measurement of any process gaps. Those of you routinely hammered by ROI questions will applaud the focus on actionable metrics aimed at cost quantification.